Port Townsend, June 25 2011. So I was chatting a friend of mine Saturday afternoon. 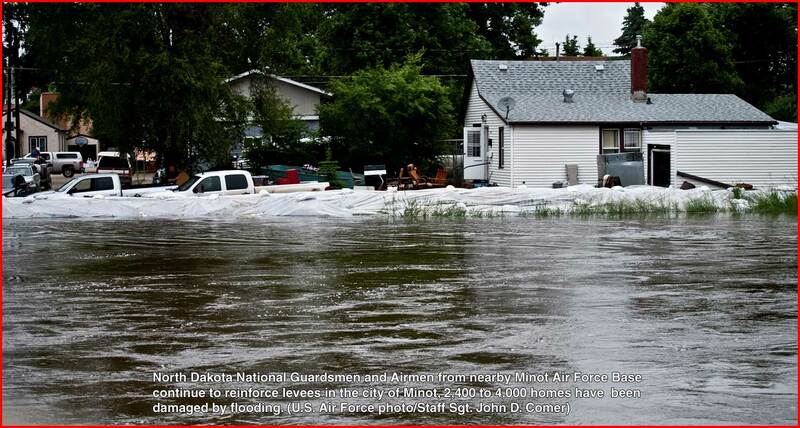 Our conversation eventually got to the flooding on the Missouri River. 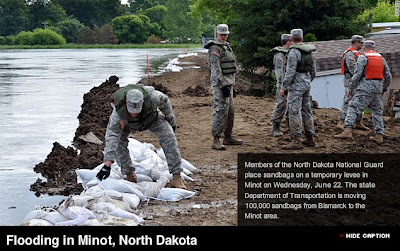 Knowing that I had taken an interest in reporting stuff the media overlooks, he asked me if I knew about the levee breaks on the Missouri River, causing flooding in Minot, North Dakota. "Well Dave, Minot is not on the Missouri River." So if Minot is not on the Missouri, what is causing the severe flooding of Minot? While NBC did mention the Souris River, even if the audience caught the name "Souris," I would bet they would think it to be a tributary to the Missouri. The Souris River is very unusual. The river has it's headwaters in Canada, runs south, looping through Minot North Dakota, and then runs north, eventually ending up in Churchill Bay! However, the residents of Minot North Dakota know all about the Souris River. 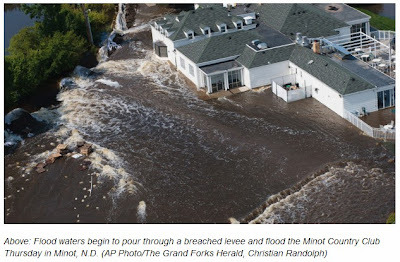 The current record flooding comes only two months after the river caused a great deal of angst! 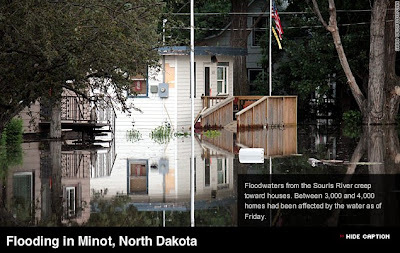 The Souris travels southeasterly, crossing the border into North Dakota about 75 miles north of Minot. 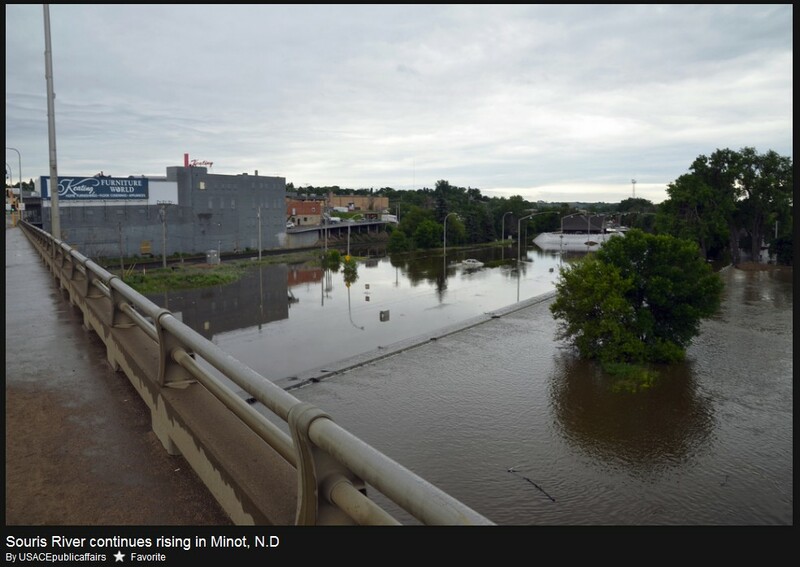 By the time the Mouse reaches Minot, it is a classic struggling meandering river. 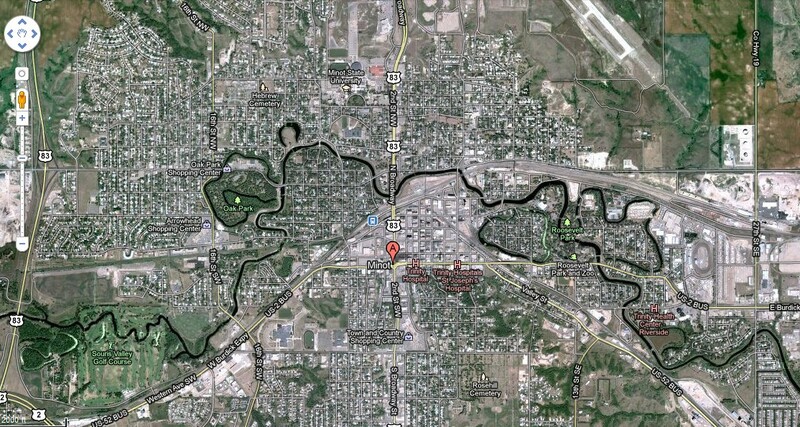 Look closely at the Google Earth view, and note the torturous path the Souris weaves, bisecting the town of Minot. In this view, the river is flowing left to right. Moreover, no less than five oxbows appear in this view! Several oxbow lakes enunciate the river's history through Minot. These days, the Souris is more like a raging lion than a timid mouse. Scroll down the page to see video shot from a helicopter. This video is among the most comprehensive inventory of flood damage posted on the Internet. The clip runs almost 8 minutes. It is appalling. 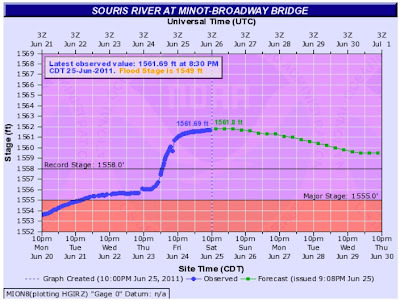 This graphic shows the river stage at 1561.9 feet overnight into Sunday (June 26th.) 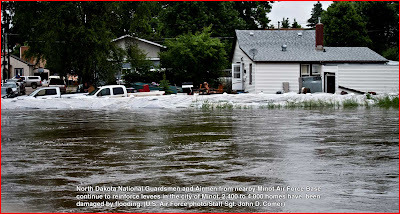 setting a new record flood level. The historic high-water was 1558 feet, recorded on New Year's Day, 1881. 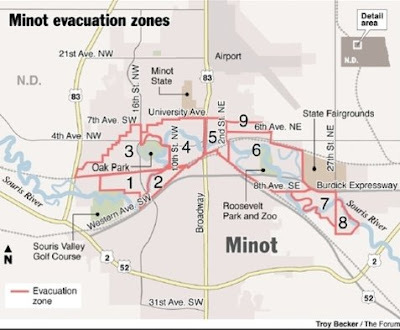 Leaving Minot, the Souris struggles southeasterly another 20 or 30 miles, before creeping into a northerly trace. She crosses the border a second time, entering Manitoba about 20 south of Melita. 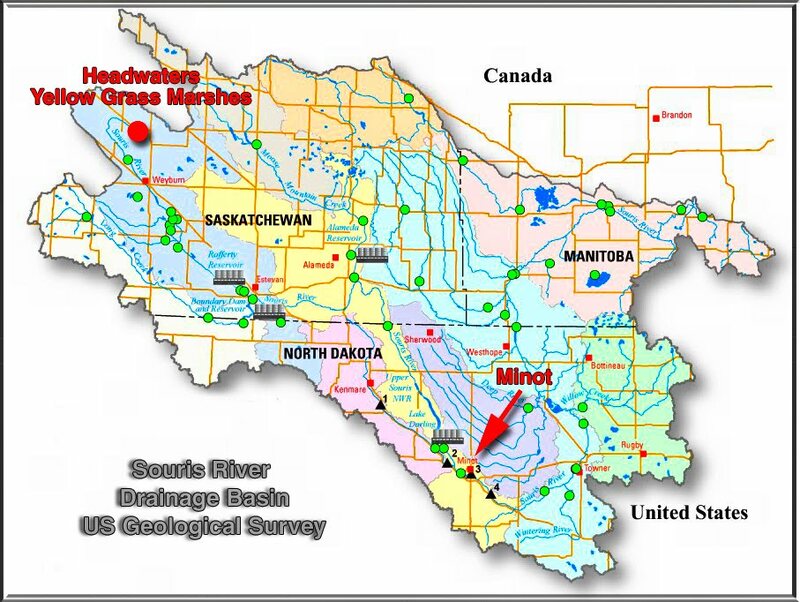 Near Brandon Manitoba, the Souris joins the Assiniboine River, traveling east to join the Red River at Winnipeg. Those waterways, as well, have seen their share of headline space this year! 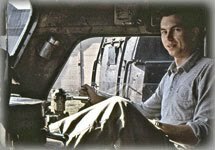 Robert, I hope that you will do a report on the recent Amtrak Zephyr/truck collision that will shed some light on just what occurred. The major reporting on this has been terrible: shallow, poorly worded, not researched and useless. I know that it is still very early to get details but, surely there are some better interviews with passengers than what I have seen on various sites. I have long been critical of the hi-level cars because the handicapped passengers on the lower level cannot move between cars should there be just this sort of event. Hopefully, the pattern of passenger exiting will be revealed as the NTSB report is developed. Thanks for your great research and sharing that with us.